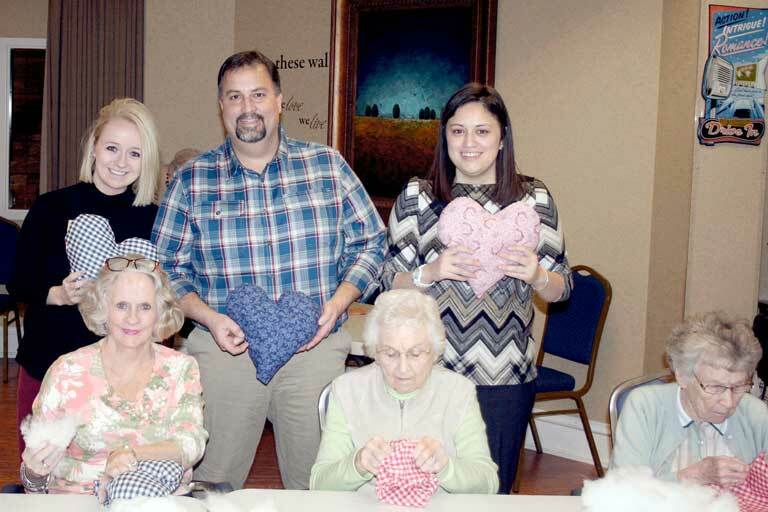 The ladies at Garden Plaza at Cleveland have banded together to create handmade, heart-shaped pillows for those who could use a soft, tender touch following a medical procedure. 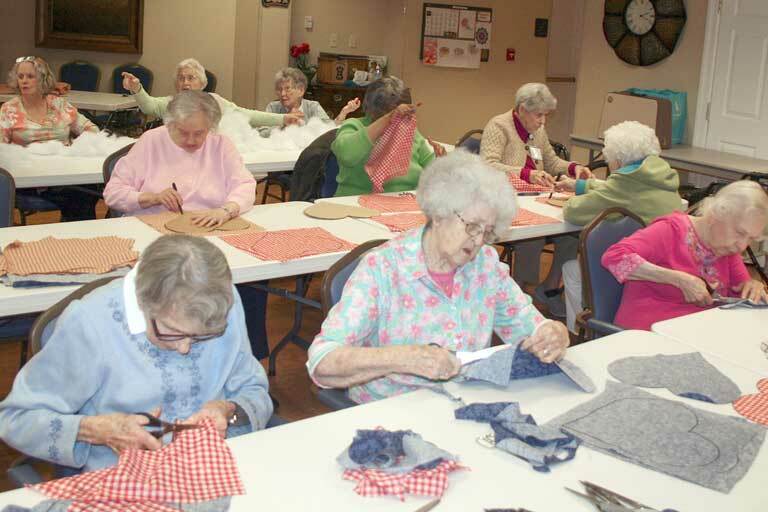 The residents of Garden Plaza, are performing this labor of love for the second time since 2013. “A great part about our community is that different members of the management team will be interacting with our residents once a month through different activities,” stated Garden Plaza Sales Associate Lynda Copley. Copley explains that each month a different activity will take place, as in December, Renee Curry taught a cooking class on the history and design of Christmas stollens. “Four or five years ago, when I was in Activities, as the Activities Director, Lynda presented a program that she had developed, which was a ladies’ group doing all sorts of activities,” stated Garden Plaza Hospitality Director David Dailey. These pillows mean a lot to their recipients, as Virginia Humberger, who is a former recipient and current pillow-maker, states. 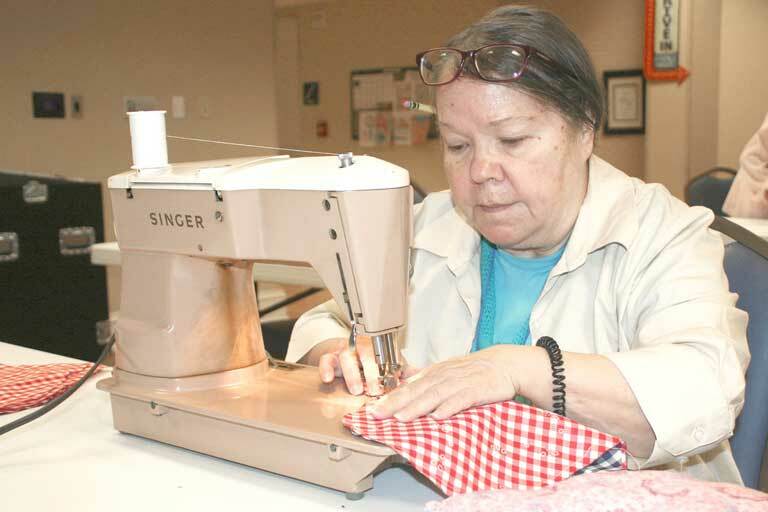 Humberger was at the event stuffing pillows as her eyesight prevented her from sewing. According to Copley, the residents love giving back to the community and those whose lives they could touch through their activities. An example of this would be how the ladies wrote Christmas cards and created gift boxes using Renee Curry’s cookies to send soldiers their own Christmas gifts in December. Emma Myers, Garden Plaza Activities Director states that not only are the events helping the residents, but the residents’ actions are helping others outside the walls of Garden Plaza. “We’ve donated these pillows to the Chattanooga Heart Institute who give these pillows to patients who need something to squeeze, but it also has more meaning to it than just a store-bought pillow, as these pillows are made by our residents with love,” Myers said. “We are very glad that we all came back together to brainstorm for all these great ideas that will involve our residents and help the community in the process,” Dailey said. Future activities include painting, cooking and numerous other activities that each manager of Garden Plaza devises personally each month. Upcoming Garden Plaza events include a cystic fibrosis nacho bar as well as a food drive on the same day of Feb. 16. The food drive takes place from 10 a.m.-3 p.m. where the public can drop off any non-perishable foods. The nacho bar takes place from 11 a.m.-1 p.m. and only costs $6 per meal. There will also be a nacho bar held on March 23. All proceeds from these events will go to cystic fibrosis care and research. “I think that our residents can really relate to the struggles that some people in our community face, so their willingness to work on projects and help others is absolutely inspiring,” Myers added. Activities occur once per month at Garden Plaza in Cleveland. Story and photos originally published on Feb. 3, 2018, by Cleveland Daily Banner.